The following is a “publication-friendly” edit of my Monte Shelton write-up for the “Jag Mag” a monthly put out by the Seattle Jaguar Club. It is still in progress as I whittle it down from my usual verbose report. I started off with ~5000 words and hope to get it down to close to 1000. I’ll pick a few good photos to accompany it as well. Check back often. My father and I have been TSD (Time, Speed, Distance) rallying now for over eleven years and you would think by now that we’d figure out how. The one thing we have learned is that when we’re on, we’re on. But… when we’re off, we’re REALLY off. 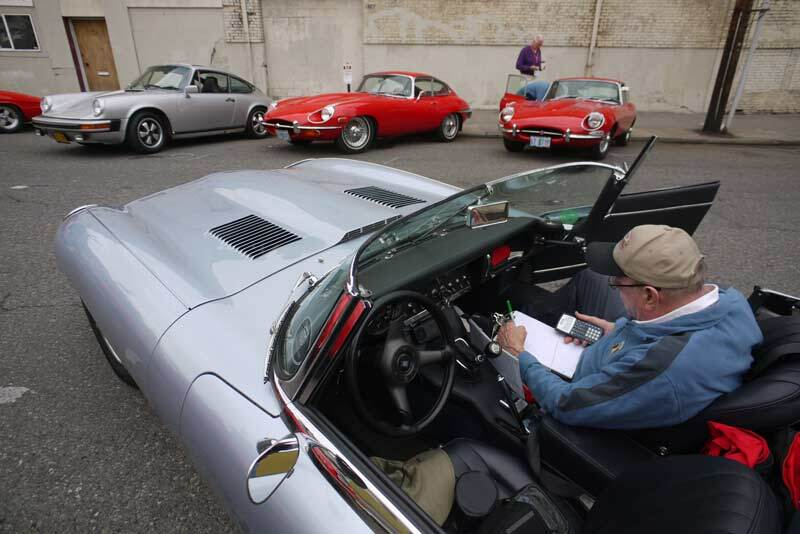 For the past three summers we’ve attended two, highly competitive vintage TSD rallies together in the Pacific Northwest. 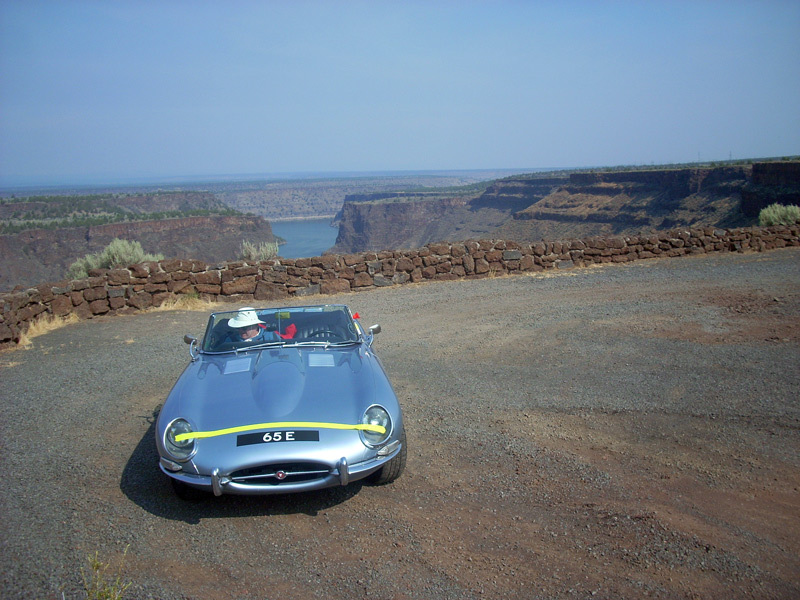 Every June we join the Classic Motorcar Rally, and every August we’ve run down to Oregon to participate in the Monte Shelton Northwest Classic. 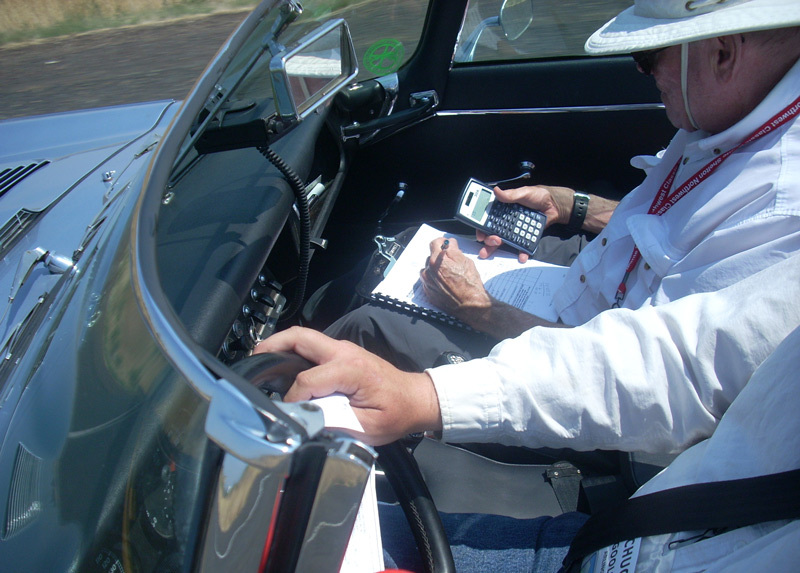 Both events provide formidable challenges for the vintage rallyist, while being great fun for all. We’ve settled into the roles of myself at the wheel as Driver (and under the bonnet as Mechanic); and my father, Charlie Goolsbee doing all the really hard work in the Navigator’s seat. We’ve done well, with constant improvement in our finish positions each year. Our best run at the Monte Shelton was last year; we finished 9th out of 80 cars. In our June effort at the Classic Motorcar Rally we blew the first morning, becoming lost on the second segment and spending the rest of the rally recovering. We feel very confident about the 2009 Monte Shelton. They’ve altered the format a bit, making it easier: there will only be ONE, non-hidden checkpoint per TSD segment. The key to our success will be to STAY ON COURSE. 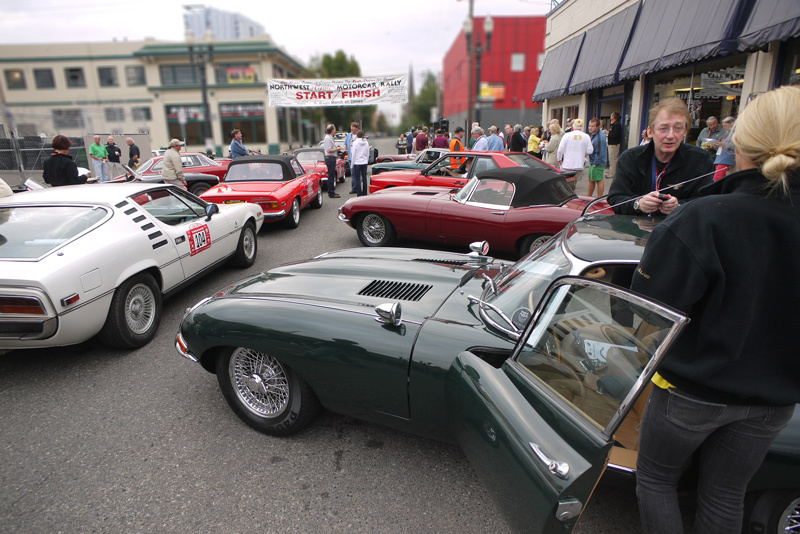 The 2009 Rally begins in at Monte Shelton Jaguar in downtown Portland with much fanfare, flag waving, pomp, and circumstance… but due to our low number (#13 of 50 cars) we miss most of it. Instead we’re following the course’s first transit segment out of Portland south towards Lake Oswego where we’ll be given TSD route instructions. Once armed with the route instructions Dad starts building our pace notes and I do what drivers do when waiting for a start… wander around, chat with other drivers, and try to relax until our start time. Time arrives for our first TSD segment. After a bit of tricky navigation we settle onto a large 4-lane road going southbound and I ask my navigator how long we’ll be on it. He replies “It looks like we stay on it until the end of this segment.” Then we see rally cars with confused occupants going the other way – never a good sign. Soon after we realize why. Things we should have seen remain unseen and we start trying to figure out where we’ve gone wrong. Dad finds it: we missed a left turn, labeled as “straight as possible” in the route instructions, but we missed it as the main road was in a curve. I drive fast to make up time and near the end of the segment we pass the checkpoint, two minutes and four seconds late. We’ve already missed our start time for the next segment and Dad is giving me instructions rapid-fire as I drive at a hurried pace. About four miles into the second TSD we realize we’re lost… again! We backtrack to the very beginning of the segment and recognize that we went straight at the start rather than right. I drive right at, but not beyond what can be described as “reasonable and prudent” for three short TSD segments. Passing Rally Cars with numbers in the mid-20s at first, and eventually those closer to our own #13. Dad is beside himself and I’m just single-minded on getting us back to our proper position. We know we’re very far behind our time and I keep pushing ahead when I can. We pass a checkpoint, whose course workers are getting a good laugh at our pace, and manage to arrive at a rest stop between segments with a few minutes to spare before our scheduled departure. From here to lunch we stay on-course and on-time on one TSD and a long transit stage. Sigh. When we’re off, we’re REALLY off. The weather turns all Northwest on us as we ascend Santiam Pass after lunch. The top goes up and I seal it with my usual bright yellow tape. 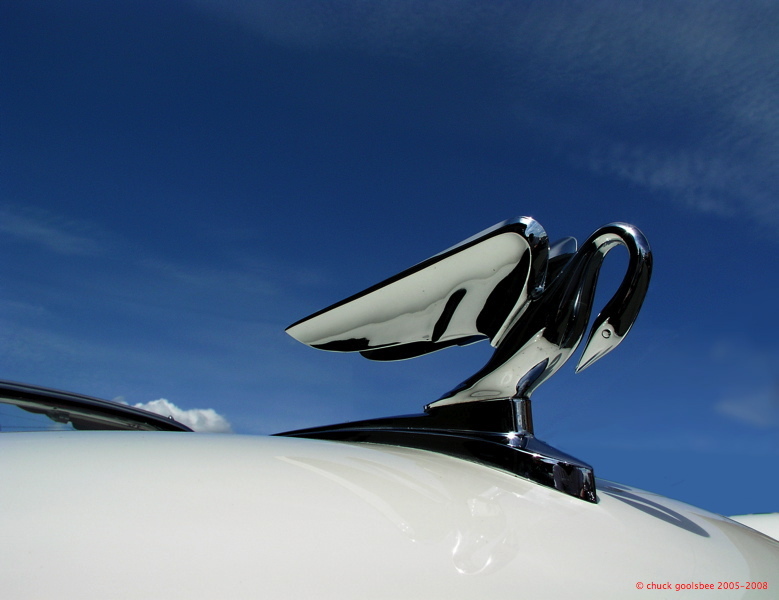 Without this “aftermarket weatherstripping” the top of the windscreen becomes the lip of a waterfall, which pours down upon the driver’s hands and the navigator’s calculations. We’d prefer this trip over the Cascades to be less eponymous of the range, keeping ourselves and our workspaces dry. We arrive in Sisters, Oregon bathed in sunshine and jammed with vintage sports cars drinking gasoline. While waiting in the queue I drop the top, and recalling the rainy weather forecast I retain the yellow tape by applying it to the nose of the car. If it rains I have a pre-sized weather-strip handy. From Sisters we rally northward on back roads in the area between US 97 and the Cascades through ranches and farms. Two TSD segments bring us to Madras, and finally to our base of operations for the Rally, the Kah-Nee-Tah Resort. We feel pretty good about our performance as it seems Dad & I have gotten back on our game. I have to admit, this was enjoyable. It became something of a mental exercise to come up with good ones. At dinner the day’s results are passed out and we’re in twenty-ninth place out of forty-five cars. We promise ourselves that we’ll do better tomorrow and wander off to bed. When we’re off, we’re really off. The next morning we take off for the first segment and about a mile down the highway perform a four-wheel drifting panic-stop and a hard reverse maneuver as we ALMOST miss a turn. Not a great start of Day Two, but we recover in time, and in fact finally fall into our groove. Other than a bit of confusion in the town of Culver, where I’m certain we missed a turn but somehow managed to recover nonetheless, our entire morning seems to go by very well. The afternoon consists of progressively more difficult TSD segments, twisting and turning all over the rolling hills and canyons of north-central Oregon. We stay in our Zen-like Rallying Groove with only a couple of minor errors. At the finish the Jaguar gets the traditional end-of-rally collective car wash, in a party atmosphere complete with a keg of local microbrew. At dinner we hear a talk by racing legend Janet Guthrie, and afterwards hear the Rally results. We have moved up to 19th place (from 29th), collecting a “silver” medal for the effort. Not bad considering! The scoresheets are handed out and they tell a far more intriguing tale. On the 10 TSD’s today we collected the following penalty times: 0:01, 0:00, 0:11, 0:02, 0:02, 0:04, 0:02, 0:02, 0:19, 0:10. That comes to a grand total of 0:53 seconds off the entire day. Only one team did better than us, with 0:27, and they won the whole rally. Only three teams collected less than two minutes of time, and most accrued four minutes or more. If only we could have done as well yesterday! We’d be right in top tier. Like I said, when we’re off we’re off, but when we’re on, we are really ON! A discussion came up on a mailing list I’m on of places one should see before they die. I tossed in my contribution, which boils down to a list of highways one should drive. Always about the road with me I guess. Of course I listed CA 1/US 101 on the west coast, and the Cabot Trail on the east coast, but I also had to mention the Beartooth Highway on the Montana/Wyoming border just NE of Yellowstone Park. Truly one of the most spectacular drives on this continent. 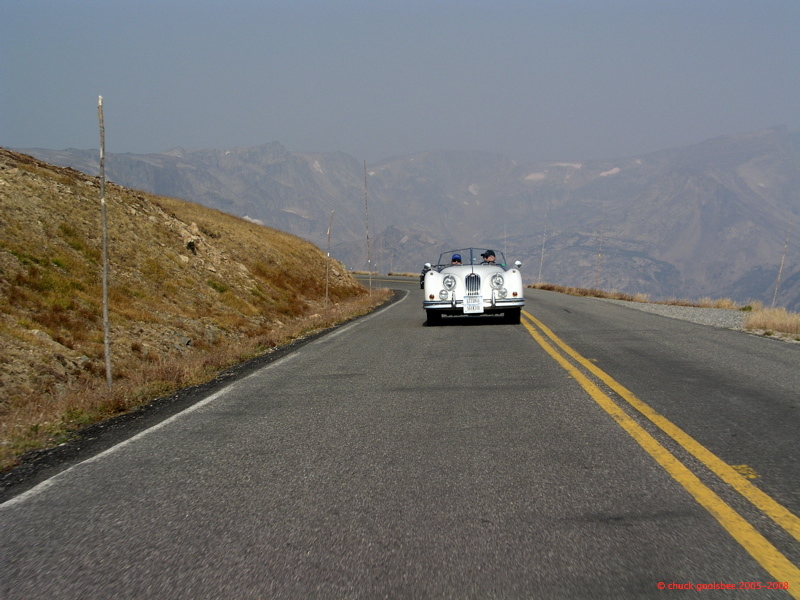 What better way to see this road than in an open two seater vintage Jaguar? 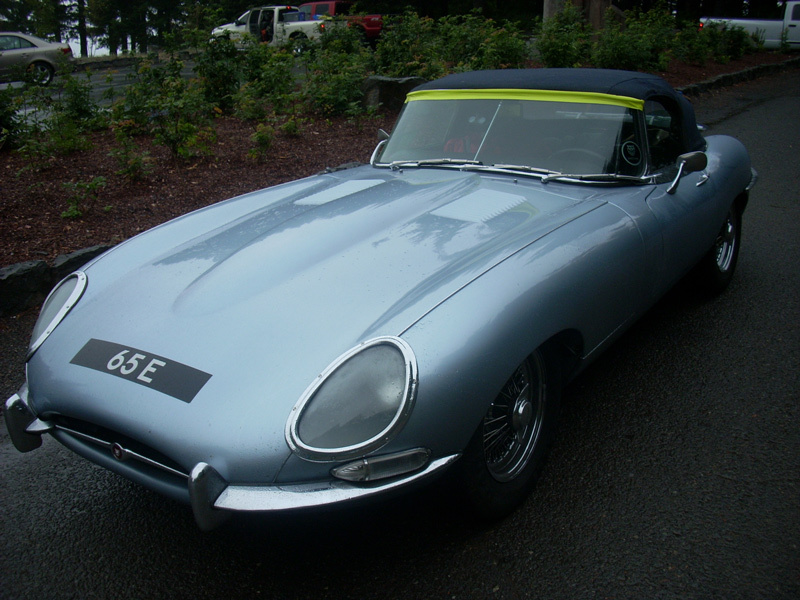 I’ve driven it twice in the E-type, one time accompanied by this Jaguar XK 140 pictured above. 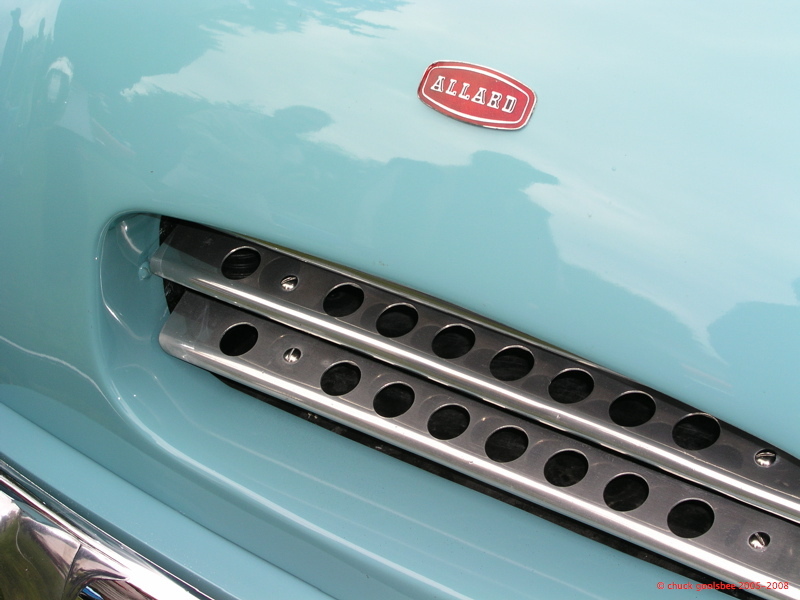 This car has been featured as a “name this car” here on “c.g.o./CPotD” before, so no need to play guessing games (besides, several recent ones remain un-guessed!) but it is nice to look at on a late summer Sunday, so here it is. Enjoy! Oddly categorized as a “travel” book, this is really more about driving. Specifically long-distance, intercontinental driving in pursuit of a world record. This entails the raising of other people’s money (aka sponsorship), registration and verification with those in charge of keeping such records, and logistics on a grand scale. Logistics of the sort that bureaucrats dream of, and want to imprint their stamps upon. In triplicate. The record in question was driving the length of the Western Hemisphere, from Ushuaia, Argentina on Tierra del Fuego to Prudhoe Bay, Alaska, a distance of of over 15,000 miles in twenty-three days, twenty-two hours, and forty-three minutes. The distance however was not the limiting factor on this drive so much as the logistics and sheer bureaucracy of crossing more than a dozen borders, some of them hostile. The legwork required to acquire all the permissions and paperwork is touched upon, and then the actual acts of doing it is described with humor and wit. This drive was completed in September and October of 1987 by Canadian Garry Sowerby, and the author, Tim Cahill. They beat the previous official record by weeks, and the previous unofficial record by many days, therefore earning themselves a rightful place in history. If you don’t recall the record being set you can be forgiven as the nascent 24-hour-a-day news media were wrapped up in other events. Sowerby & Cahill exhibited amazing skill, but horrific timing in that upon their arrival in the USA the news media were distracted; as they arrived in Texas for a press conference the day a toddler named Jessica fell down a well elsewhere in Texas. Their arrival at Prudoe Bay coincided with the stock market crash on “Black Monday”. Literally a year of hard work and planning, followed by a month of marathon driving, all lost in the noise of other events. They did not announce their attempt until they arrived in the USA for fear of criminal attempts to waylay them for ransom, a genuine threat in parts of Latin America. They did let various governments know ahead of time to secure the permissions required. The book isn’t so much a travelogue as the telling of a tale. Sketches of places and events are drawn quickly and for the most part discarded as the landscape changes constantly around them. Cahill is an excellent writer and keeps your attention going throughout, frequently generating outbursts of laughter from the reader. I sought this book out specifically for a summer read as it serves as an oversized parallel to my own little drives. I’m not looking for records, but I tend to go for distance over dallying. There is a sort of bond that develops between drivers on a long-distance jaunt that is hard to capture. Cahill does an excellent job of doing so through humor, even though many of the situations and emotions at the time are anything but humorous. My only complaint about the book was the breezy fashion in which the final third of the journey was summarized. It felt as if Cahill ran out of time or up against a publishing dealine and just Cliff’s Noted the last parts of the journey. Sure the bulk of North America represents easy driving and a lack of Latin America border crossings but there is still plenty to see and experience. It is a breezy and enjoyable read and I highly suggest any one interested in driving for driving’s sake to give it a look. While I prefer to display gorgeous vintage engines with polished aluminum or turned finishes, occasionally I show the other end of the continuum. 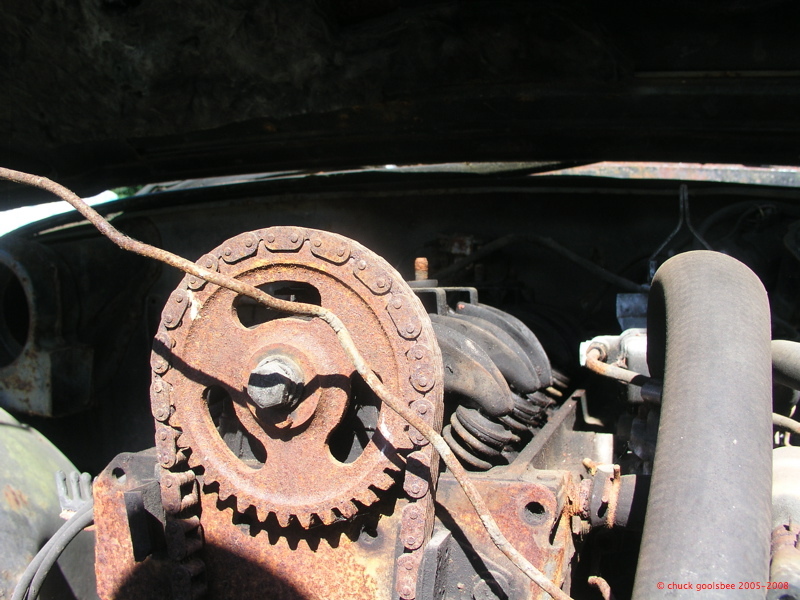 Oxidation is the eventual fate of all of man’s automotive engineering efforts as rust indeed never sleeps, while man too often does. 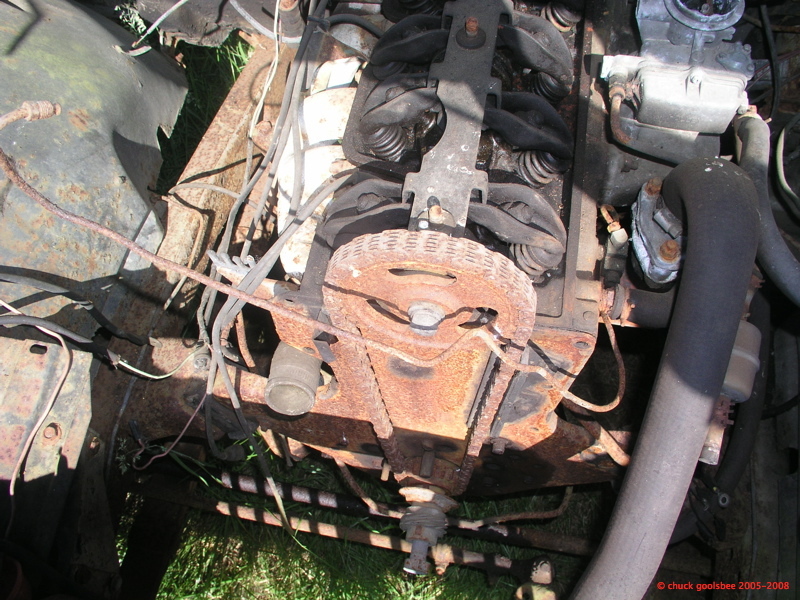 I found this tired old engine in a field off Burn Road here in Arlington. A man there has accumulated a cache of two makes, one European, and one domestic, and a buddy of mine was picking over them for parts. I tagged along to get some photos and knowing that my Jaguar shares an air filter with one model of one of the makes thought I might just fine a canister for it if I was lucky. I wasn’t, but I did see a lot of rust. 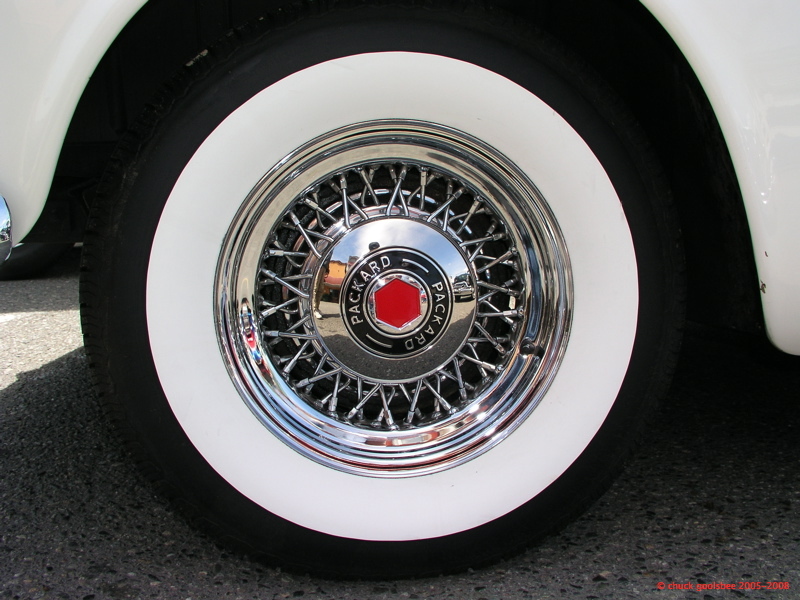 Can you name the make and model of this vehicle based on the photo? Found another detail photo of that big Clipper to share. The marque should be pretty easy to guess based on the simple visual hint, but can you name the model as well?